It’s easy to do, I guess. 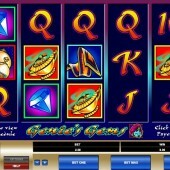 You’re a hardworking slots designer at Microgaming, you’ve been burning the midnight oil to get that new slot out the door, and to be honest, you’d rather just be down the pub. So, you’ve put the finishing touches to a 5 reel, 5 pay-line online slot based on the Arabian Nights. You’ve got the genie all glowing in blue, the gold lamp too, the magic carpet, even a picturesque minaret – now, what’s missing? Damn – the bonus rounds! Frantically, you dash back to the office after a few swift halves and try to make amends, but it’s too late – the game’s been processed, packaged and off to sit in a dozen online casinos’ lobbies. 10,000 Coin Jackpot Ready to Win! The Genie icon is the game’s top payer, awarding a 10,000-coin jackpot if you hit five Genies across the reels, with the Diamond symbols paying next best at 5,000 coins. When it comes to Bonus icons, however – forget it. It’s a shame that the only gems in Microgaming’s Genie’s Gems are the ones that the genie will give up if you manage to release him from this bottle. Having said that, the graphics are pleasant enough, and an Arabic-style melody plays over the top whenever you hit a winning combo. 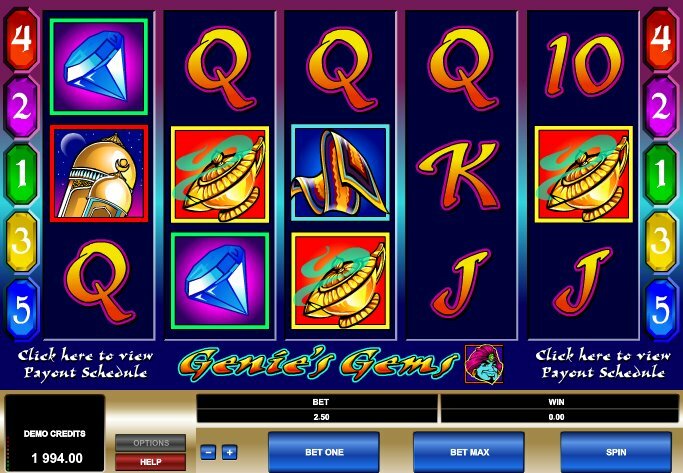 Having said that, this slot was one of the first the leading developer released online so you can perhaps forgive the fact that in-depth bonus rounds, expensive cutaway animated sequences, and Wilds and Scatters are all missing. What Else Is Out There in the Arabian Night? And with just the five pay-lines action junkies will probably want to look elsewhere. Luckily, if you’re into a bit of the Aladdin vibe, there are plenty of alternatives on the market. After all, how can you turn down the romance of the Middle East, the excitement of the Arabian Nights or the riches of Ali Baba’s cave? Oh, and a bit of genie magic thrown in for good measure. Taking a trip to the panto (but saving you from the past-it soap stars and ropey songs), Sheriff Gaming have based their Alawin slot on the classic story of Aladdin, complete with magic carpets and quirky animation in the Sheriff mould, while RTG’s Aladdin’s Quest offers some juicy cash prizes for the bonus hounds.